Fire up your printer IKEA is at it again! They just released its very own coloring book- jumping on the adult coloring book craze that’s sweeping the globe. The trend savvy Swedish company put its own spin on it, offering five downloadable pages covered with decor-themed items you might recognize from its stores. Head here with fingers crossed to download the pages- the color share has generated so much traffic Dropbox temporarily disabled the link. According to Real Simple, Ikea has no plans to release a coloring book for purchase, but that could change and more pages could be offered for download in the future. 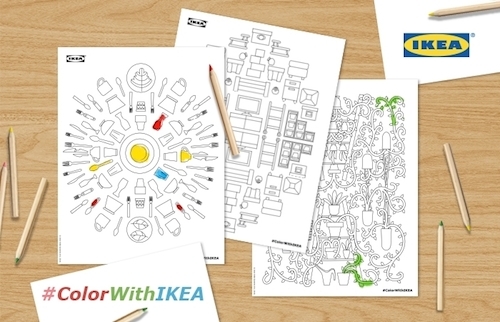 A quick peek at the #ColorWithIKEA hashtag on Instagram shows some folks have already gotten an impressive start. Coloring isn’t just for children anymore. Today’ adults are feeling increasingly stressed and overworked, and as a result are looking for a creative relief to ease the pressure of their everyday lives. That relief is coming in the form of adult coloring books. Four of the top 15 bestselling books on Amazon .com this week are adult coloring books. And it’s not just on Amazon. Coloring books for grown-ups are topping best-sellers’ lists worldwide, taking the publishing world by storm in 2015. 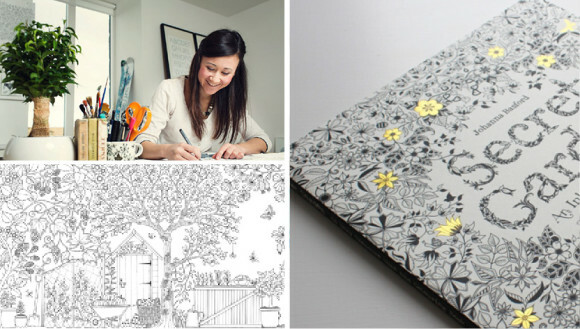 Scottish illustrator, Johanna Basford has sold around 2 million copies of her first book ‘Secret Garden’, leading to an outbreak of similar books such as Animal Kingdom and Calming Colouring. 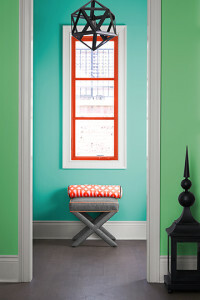 Abrams Noterie division introduced the VIVE LE COLOR! line of adult coloring books coloring books this Fall. 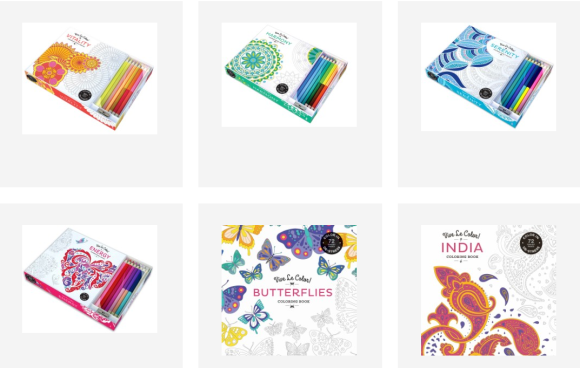 India, Butterflies and Japan are the first in an ongoing series some even packed with colored pencils and detachable pages so you can display your finished artwork. According to Abrahms, in a world where computer screens, cell phones, and tablets reign supreme, coloring books bring about unfettered comfort, joy, and utility, hearkening back to a less complicated time in our lives amid the chaos of today’s technologies. The line is already a runaway success in France. Back in 2013, Trend Bible first introduced the trend Originate, as part of the Home and Interiors Spring Summer 2015 trend book. Capturing a key message of ‘don’t forget to play’, this trend explores how playful references are borrowed from the children’s world, impacting on the home. 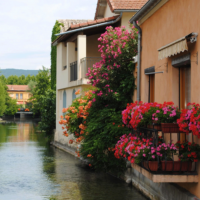 Driven by our increasing attachment to all things digital, adults crave a way to switch-off and reconnect with real life. As a result, we begin to explore creativity and ways of fusing work and play. The rapid growth of the adult coloring books is one example of this trend reaching the mass market; representing part of a much broader cultural shift towards embracing a care-free and child-like spirit. 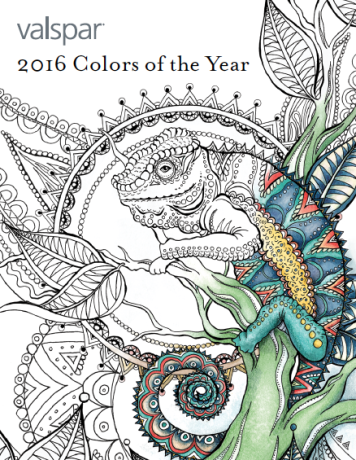 Valspar included a coloring book when they introduced their new paint trends for 2016 to explore their palettes through a downloadable coloring book featuring the four tales behind our trends. The four 2016 trend palettes are defined as Comfort Zone, Simply Perfect, You Do You and Good Company. Genius! You can download the coloring book HERE. 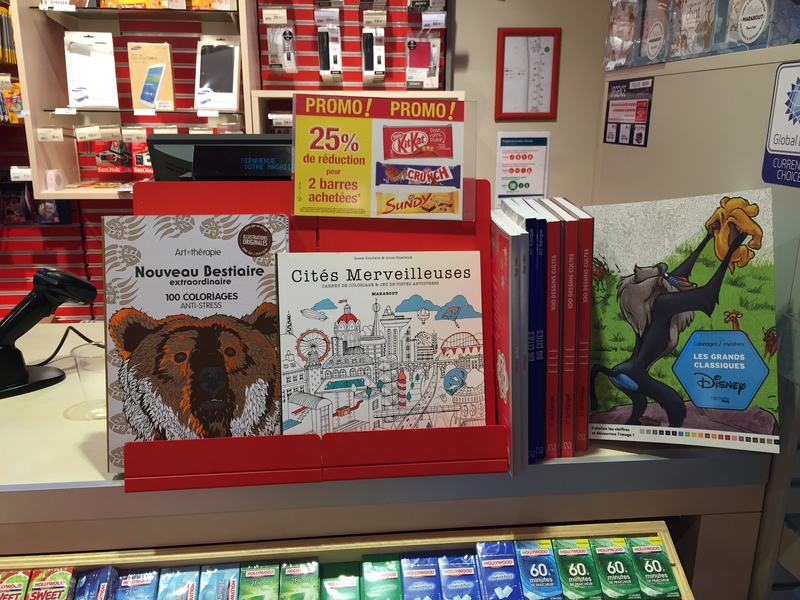 I even spotted them at counters throughout France last month. 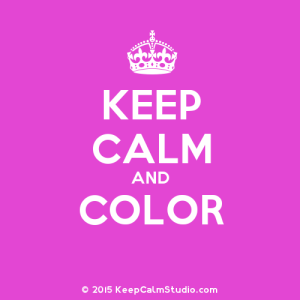 So grab that box of 64 Crayolas and a coloring book and relax!